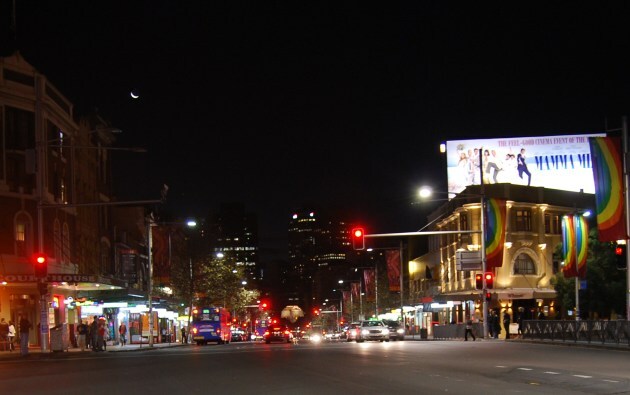 Oxford Street is Darlinghurst’s best known street, as much as it being the beginning of the Annual Gay and Lesbian Mardi Gras Parade route every year and as being known as the centre of the gay community in Sydney. 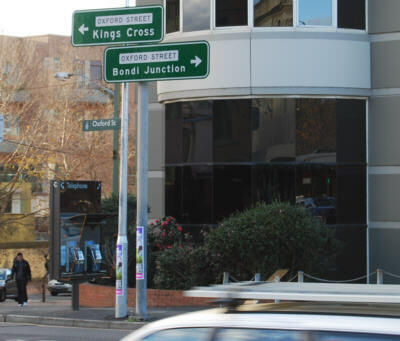 The street runs from the south east corner of Hyde Park in the city all the way to Bondi Junction. For the nightlife, on the side streets and Oxford Street itself, you can easily find a place that suits your tastes. There are plenty of nightclubs that go long into the night and as well as collection of lively pubs in this area stretching from the lower end of Oxford Street to Paddington, including the Oxford, the Grand National, the Windsor Castle, The Four in Hand and the Royal. A great variety of restaurants, from international such as Indian, Thai, Mauritian, Nepalese, Vietnamese, Mexican, Portuguese, Italian, Japanese, to the nouveau are to be found in Darlinghurst. Or tuck into a well aged steak or cut of prime roast rib or even seafood. There is plenty of choice here and not just on Oxford Street, but in the old suburb’s winding small side streets and lanes. You can also find numerous cafés and fast food outlets tucked away between the speciality shops, boutiques, restaurants, music stores, pubs and nightclubs. Victoria Army Barracks, built by convicts and soldiers in 1841 from locally sourced sandstone and surrounded by a protective wall. There is a military museum that you can visit and the complex is an interesting example of 19th century military architecture. On the corner of Burton St and Darlinghurst Rd is the Sydney Jewish Museum. Exhibits trace the history and life of the early Jewish settlers who came to Australia, to begin a new life. It also has a number of poignant displays and exhibits relating to the Holocaust. Due to the difficulty of parking in the narrow streets that line Oxord Street, it may be easier to take the bus from Circular Quay, at the foot of the city. See Circular Quay Map. Further east is Bondi Junction. Buses to Bondi Beach run through this street, another favoured destination for visitors to Sydney. About Sydney Places to Visit Sydney Places - Sydney Surrounds. Thought about a working holiday in Australia? Find out more Work in Australia. You may also be eligible to work while studying here Study in Australia. 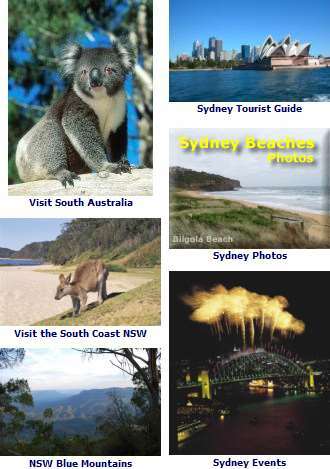 Find and Book Sydney Australia Hotels Hotels in Sydney.